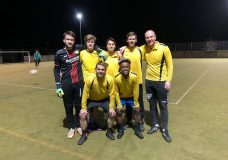 Round 15 of the 5aside league – Wednesday 16th January 2019. After being called off the previous week due to a frozen pitch, we were finally back after the ‘winter break’. The league had split into two, after everyone had played each other once before Christmas. The top 6 would play each other again and the bottom 5 plus a second team from Capernwray (called Torchbearers) would also play each other once. In the 8pm games we had a clash of last years top two Crown Lane vs Wray, who found themselves both 1 point behind Roeburndale as we headed into this last section of the league. The game started at a fast pace and Crown Lane soon went in front when Daniel G capitalised on a mistake from the Wray defence and slotted into the bottom corner. Crown Lane continued to apply pressure and Wray had Thomas Ward to thank for keeping the score at 1-0 with a couple of top draw saves. Martin Huddleston went close for Wray at the other end, but narrowly missed the target. Crown Lane quickly got back on top and went 2-0 up through Oliver Parkinson. They grabbed the third when Dan Parkinson dribbled through the defence to put Crown Lane in a commanding lead. Wray refused to lie down and they quickly replied through Mark Ellershaw who volleyed in from close range. Wray looked to mount a comeback and were unlucky to see a 4th goal go against them when Sam Hoggarths deflected shot left Thomas with no chance in the Wray goal. A t half time the score was 4-1. Crown lane started the second half the same as the first, Sam Hoggarth scoring his second and Crown lanes 5th moments after the restart. Before Daniel G grabbed his 2nd of the evening to make the score 6-1. Wray showed tremendous courage and determination to get themselves back into the game. Wave after wave of attacking football soon brought about reward. Steven Wright pulled one back with a neat finish on his left side. Quickly followed by Mark Ellershaws 2nd of the game with a powerful drive into the corner. The score 6-3 with 10 minutes remaining and all to play for. Martin Huddleston got in on the act and scored a wonderful volley into the top corner of the goal. Martin quickly grabbed his second of the night to make the score 6-5. Crown lane were backs to the wall defending for their lives as Wray pushed for the equaliser. Both keepers made tremendous saves in the latter stages but Wray’s hardwork payed off when Mark Ellershaw got his hat-trick goal and his side’s equaliser with minutes to play. A superb game of football played in tremendous spirit between two of the best sides in the league. Difficult to award a man of the match but Wray’s Mark Ellershaw and Crown Lanes Oliver Parkinson both enjoyed very good games. A point was a fair result for both sides! In the other 8pm game, Carnforth were up against Ingleton. Carnforth started the game with 4 players but they worked hard to make up for their missing man. Ingleton had a lot of the ball, but couldn’t find a way through Carnforth’s defence. And it was Carnforth who scored the first goal against the run of play, as Damien Kitchen intercepted an Ingleton pass in his own half, before firing in a powerful shot. Carnforth quickly doubled their lead through John Gorst. As the half went on Ingleton pulled a goal back in a spell where they had 3 or 4 good opportunities, but it was Carnforth who finished the half strongly as Kitch scored 2 more to get his hattrick. Second half and Carnforth scored 2 more goals, before they were joined by their 2 players who had been caught in traffic. Callum Thompson didn’t hang around and scored a hattrick in the 12 minutes he played, including one that was fantastically assisted by goalkeeper, Thomas Salmon. Josh Capstick pulled a goal back for Ingleton as he broke through a couple of tackles and smashed his shot in, via the underside of the crossbar. But it was Carnforth who took the win and the 3 points, with a 11 – 2 victory. At 9pm Oliver Parkinson shared the message. Oliver said that all of us fall into one of two categories. We are either ‘in Christ’ or ‘not in Christ’. Oliver then read Romans chapter 8 verse 1 ‘There is therefore now no condemnation to them which are in Christ Jesus, who walk not after the flesh, but after the Spirit.’ He explained that to be ‘condemned’ is to be found guilty and that all of us are guilty of sinning (doing wrong) against God. Oliver explained how Jesus took the punishment that we deserve, for our sin, when He died on the cross and that if we would turn to Him and ask for forgiveness and live for Him, then He will forgive us and we will become ‘in Christ’. In the late games we had two really close games. 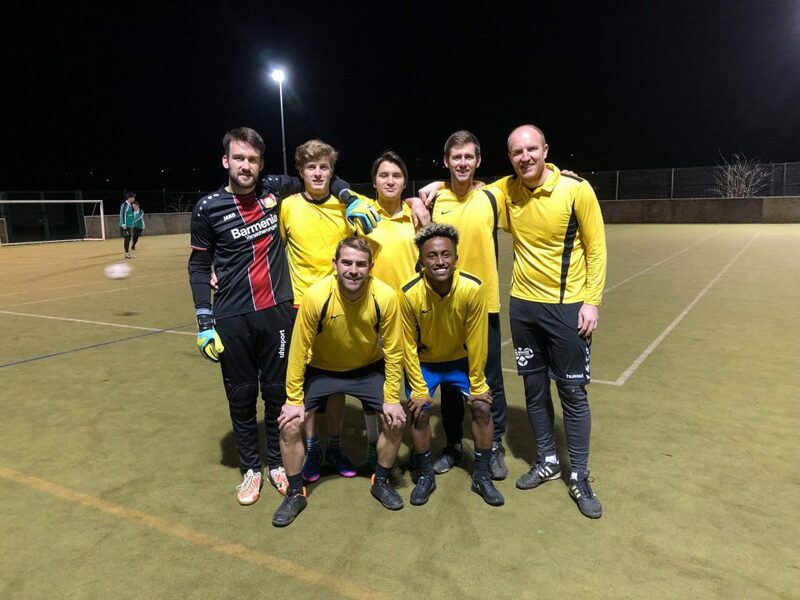 We welcomed a second team from Capernwray called ‘Torchbearers’, into League 2. These lads have been training together since September under the tutelage of Graham Atkinson and Matthew Wraight, and they hit the ground running against Lune Valley Utd. Torchbearers opened the scoring through Danny, before James Sutton equalised for Lune Valley. Torchbearers were using the pitch really well and 2 goals in quick succession from Abiola, including a penalty, put them well in control. Lune Valley stuck in there and worked hard to keep Torchbearers chances to a minimum. Almost against the run of play, James Sutton found some space on the edge of the ‘D’ to calmly slot in Lune Valleys second and just as the half was finishing, manager Alan Wadsworth levelled the scores up. Torchbearers had played really well, but must have been wondering how they weren’t ahead. Still a bit in shock from what had just happened, Torchbearers went behind as Sam Dennis fired a shot across goal from distance. Lune Valley were playing well by this point and James Sutton was next to score, completing his hat trick with some more great footwork and clinical finishing. As it often is, just as one team looks to be pulling away, they let the other team back in and completely against the run of play, Danny scored his second goal of the game. Lune Valley were playing well though and they were matching the Torchbearers all over the pitch. With 5 minutes to go James Sutton popped up with his 4th goal, which looked to tie the game up for Lune Valley. But Torchbearers hadn’t given up and they linked up to score the best goal of the game through Thomas. Quick passing put him in front of goal and a fantastic volley brought the game back to 6 – 5. Unfortunately for Torchbearers, they couldn’t quite find an equaliser, but if they play like this every week, they will pick points up. The second late game of the night saw Capernwray take on the Newbeginners in one of the most entertaining games to date. Capernwray took an early lead when Taylor took advantage of some sloppy defending beating the keeper at his near post. Capernwray continued to pile on the pressure in search of a second. Against the run of play Newbeginners were awarded a penalty when the defender touched the ball in the area. Dan Hallam fired the ball home from the spot to make the score 1-1. Capernwray got back on the front foot and soon went back ahead when Taylor grabbed his second of the evening from close range. Jacob made it 3 finishing off a wonderful team move turning defence into attack with a superb sweeping move. David grabbed his first of the evening capitalising on a loose bouncing ball to make the score 4-1. The Newbeginners replied before half time when Roy finished beautifully into the bottom corner. At half-time the score was 4-2 and the game was poised nicely. In the second half Capernwray asserted themselves well, Pascal grabbing his first of the evening to make the score 5-2. Moments later Christian got in on the act scoring his side’s 6th goal to give clear daylight between the sides. Newbeginners responded very well indeed and two quick goals from Colin Sowerby and John Kelsall made the score 6-4 and we still had 12 minutes to play. Capernwray were then awarded a penalty of their own when Dan stepped in his own area whilst playing the ball. Taylor assumed responsibility for the spot kick and powered it high into the roof of the net making the scores 7-4 to Capernwray and complete his hat-trick in doing so. Newbeginner’s refuse to lie down and were right back in the game when Dan grabbed his second of the night before setting up Roy for his second of the night to make the score 7-6. Capernwray rallied and substitute Tobias continued his fine form in front of goal finishing off a well worked team move to make the scores 8-6. Taylor grabbed his 4th of the evening to put the game to bed before a late consolation from Roy, completing his own hat-trick but sadly it was to be in vain as Capenwray ran out winners 9-7. A thoroughly entertaining game of football played at a great pace with both sides giving it there all. Man of the match award goes to Taylor who not only scored 4 goals, but played a pivotal role in his side’s performance. Well played both sides.